When it comes to video, YouTube is a final destination for everyone. There are many free software, tricks and hacks to download YouTube videos. Some software provides an option to download an MP3 track of video you want. But the problem with all these software is they are not that easy to use and you have to copy the video link and paste it in the software. Also every software is specialized for some format. Some Software is for normal quality VIDEO download and some are for HD download. Online downloading websites is also there which rout the YouTube video through their own site and most of these online YouTube video download sites are full of advertisers and also provide proxy download button. "YouTube Center" is a simple user-script which create a simple download button bellow every playing video. You can use it to download any YouTube video in WebM, MP4 and FLV format will various resolutions like Full HD, Standard and Low definition. It also support for downloading music track in MP3 format. The best thing is you don't have to leave YouTube website. It just adds a simple button that gives the option to download the video. 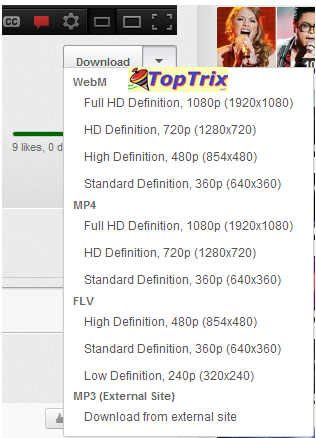 "YouTube Center" gives the option to download video in various formats and various resolutions. You can also download an MP3 music track of the YouTube video you want but it gives you option thorough external site which is good and simple. It directly extracts the music track in MP3 format. You have to make settings to create MP3 option in the download menu. Once installed, you don't need to have any downloading software or application, free or paid. You don't have to depend upon third party online serviced to download. This is a simple and the best YouTube video and MP3 music Downloader for all types of video formats and also for music streamed. Download "YouTube Center" from here. ( You must have a "GreaseMonkey installed for your browser to run it if you are using Firefox. Download GreaseMonkey for Firefox. This script works with Firefox, Chrome, Opera.